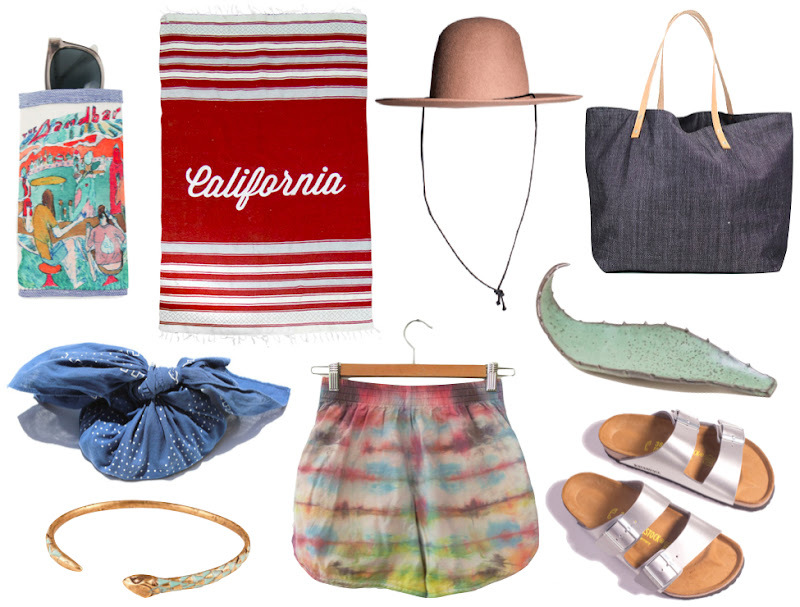 Clockwise from top left: Sunglass Case by artist Kyle Field ($30); Coastal Collection beach blanket ($70); Westerlind Felt Hat ($98); Denim Tote Bag ($125); Ceramic Aloe Leaf by ER Studio ($165); Silver Birkenstocks ($90); James Kidd Tie-Dye Shorts ($49); Snake Bangle ($150); Beach Checkers ($47). beach blanket link doesn't display item - do you have any more information about it? I think it may have sold out...sorry. I think that may have been a limited edition item too, because I didn't see it anywhere else when I was looking into the company (couldn't find a website for them, just discovered it through the store).